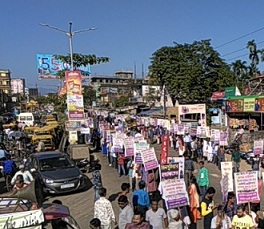 A mass rally was taken out in the main thoroughfares of Silchar town on Tuesday and thousands of people shouted slogans in unison demanding that the five documents left out from being a part of the National Register of Citizens (NRC) process be incorporated once again. The protestors also demanded that any other documents required for the mammoth exercise should be “easily accepted” by the NRC authorities. The Citizens Rights Protection Coordination Committee (CRPCC) led the rally. Forty-three other organisations also took party in the rally which included the Silchar District Congress, All India Students Democratic Organisation (AIDSO) and the All Cachar Karimganj Hailakandi Students’ Association (ACKHSA). The rally started from Silchar’s oldest club – India Club – and ended at Silchar’s National Highway (NH) point. Shouting slogans, the protestors also demanded that the documents of those people whose names have been left out from the final draft of NRC be verified through a legal process. The protestors also demanded that all detention camps be closed down and the process of fresh identification of ‘D’ voters be stopped. Dr Bhattacharjee informed that similar rallies would be held on November 15 and 17 next in Karimganj and Hailakandi districts, respectively. He also said that an open court would be held in Kolkata very soon to discuss the entire NRC issue once the Panchayat elections were over in Assam.